Chris Brown‘s legal entanglements keep on coming. The “Loyal” singer is being sued by a man who says he was shot at one of Brown’s concerts, arguing that the singer and the venue took inadequate security measures, especially given Brown’s reputation for attracting violence. 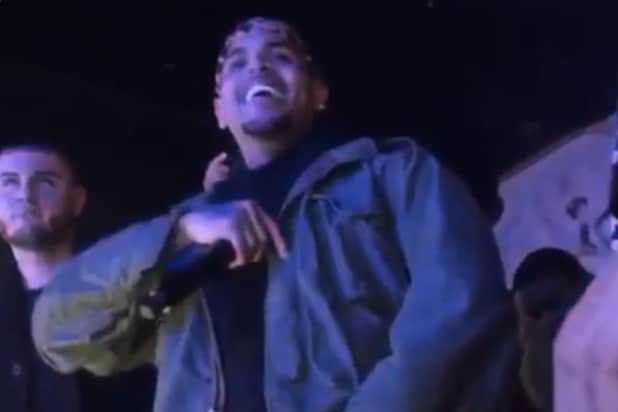 As TheWrap previously reported, police said five people were shot at the Fiesta club as Brown belted out his chart-topping hit “Loyal.” Video posted on social media sites showed the singer ducking for cover as gunfire rang out inside the venue. Briley’s complaint lists a litany of previous incidents at events involving Brown, including an August 2014 incident involving gunfire at Los Angeles’ 1Oak nightclub where fallen hip-hop mogul Suge Knight was shot; a September 2014 stabbing at the Supperclub in Hollywood; and a “violent altercation” involving Brown’s bodyguards at a New York nightclub in 2012. Despite this legacy, the lawsuit claims, Brown and Fiesta “failed to implement security procedures to search Bash attendees for firearms, failed to use metal detectors and to pat down persons for guns,” and neglected to implement other security measures. Briley is seeking unspecified damages “for all past, present, and future physical, mental and emotional pain and suffering, including the fright, shock, terror, and post-traumatic stress of being shot.” A spokeswoman has not yet responded to TheWrap’s request for comment.